What I know, for sure, is that making maftoul is a Palestinian tradition that few know about and still do to this day. 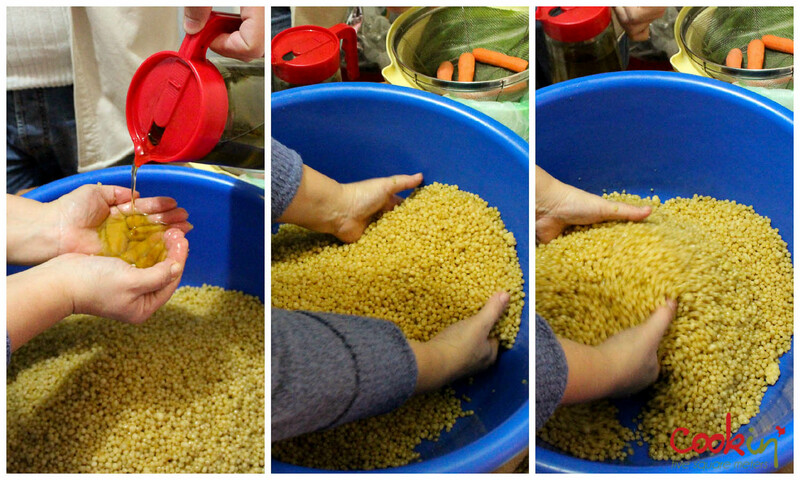 I remember the time when my grandmother used to make maftoul for the huge moghrabieh pot we cook. Mom and grandma (her mother-in-law) used to sit next to low tables with wide round shallow pots and roll the cracked wheat for hours with flour, yeast, water and oil till they get satisfactory pearls. They used to keep us busy while they work by giving us a pot with the ingredients and ask us to roll some. It was fun getting messy with our hands. Unlike the market moghrabieh, these fresh ones are more delicious and fragrant. I would allow myself to declare that you have not tasted real moghrabieh until you have tried this particular one. Moghrabieh is not an everyday dish in our family. Whenever there is moghrabieh, there has to be, at least, 7 persons at lunch. It takes time to prepare but the end result is a homogeneous mix of flavors declaring itself in the earthy crumbly texture of maftoul and the rich stew that bursts with essence of meat and bones caressing your palette with onions, chickpeas, and melange of fragrant spices. Yes, meat and bones. The best way to cook it (but not particularly the way I like it) is with lamb meat and bones. The fattier the meat is, the better the stew. I used to have it with chicken (back when I stopped eating meat for 2 years) but it doesn’t even come close to the original recipe. For this special Sunday lunch, we had special guests over. 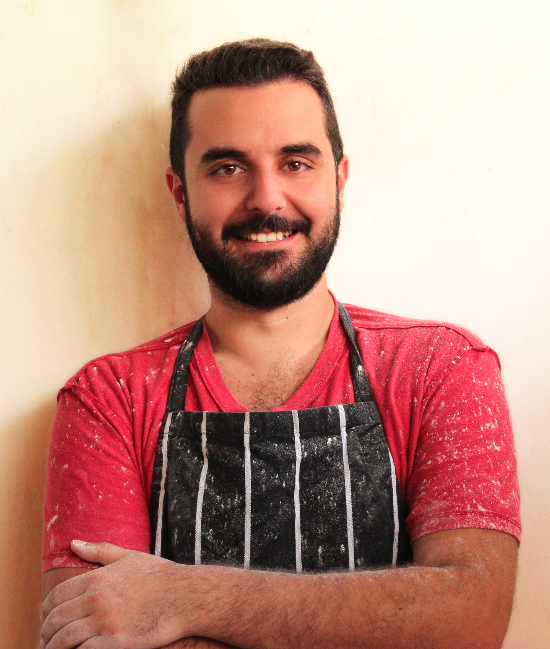 Apart from my family, we had Chef Tommy, whom I met at Food Blogger Connect Lebanon and promised to share this family recipe with, my amazing friend NaNo before leaving to UAE, and Mike who’s almost part of the family now. 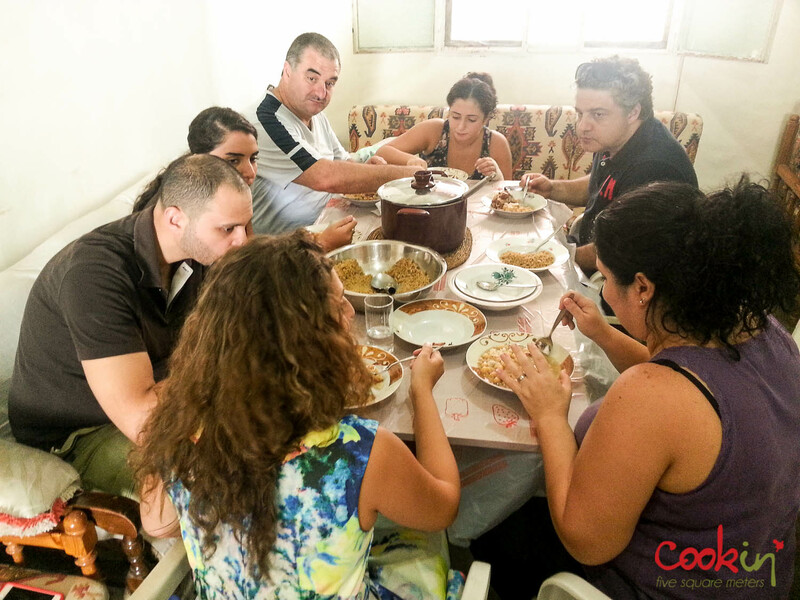 We had a live demonstration of how maftoul is made before digging in what Chef Tommy described as no other moghrabieh he has had before can compare to this. Careful, this is not burghul. It is wheat that is cracked once. You can still figure out the shape of the grain. In a bowl, mix the water, oil, yeast and salt. 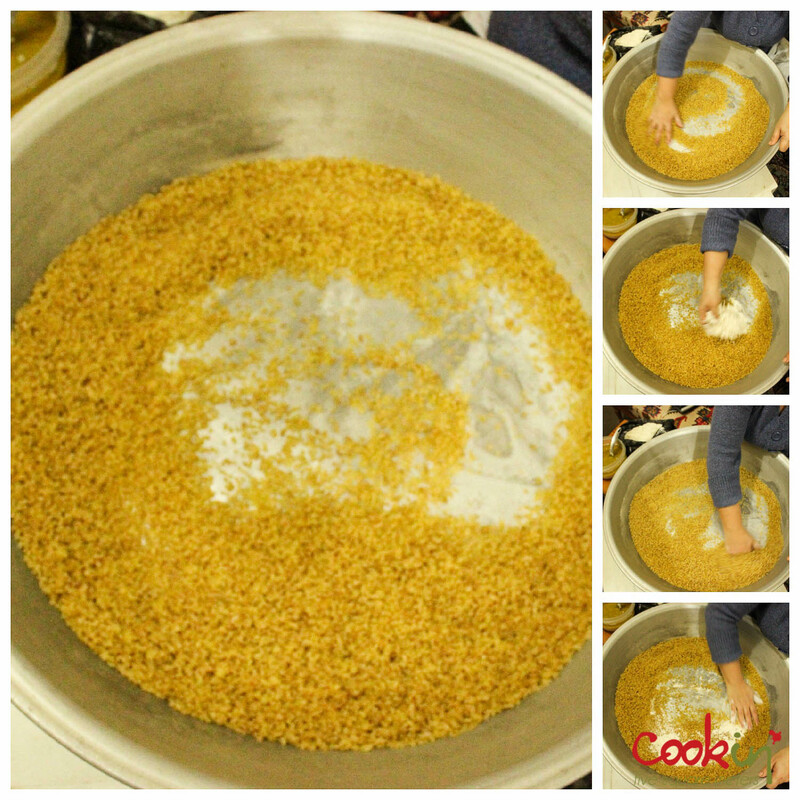 In a large shallow pot, place the rinsed and dried cracked wheat. 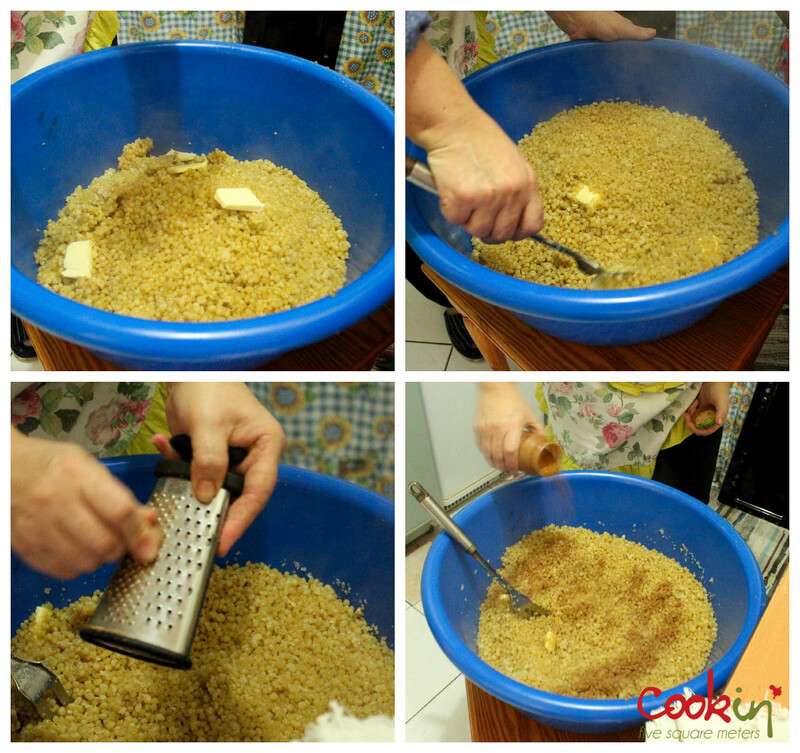 Drizzle a tablespoon of the liquid mixture over the cracked wheat and roll in the pot applying gentle pressure. Sprinkle a handful on flour over the wheat and roll again with gentle pressure. 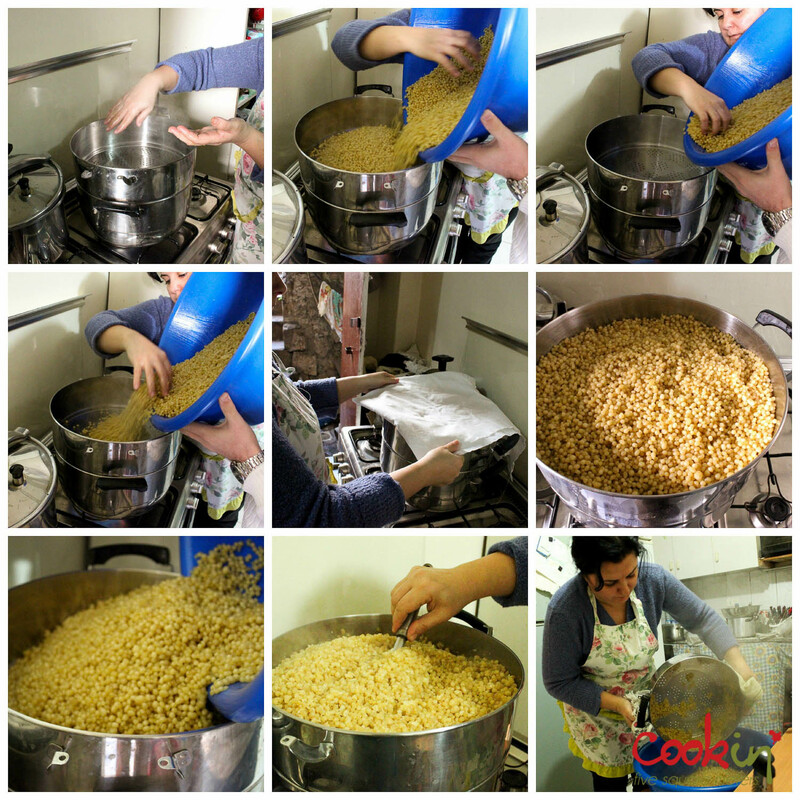 Repeat alternating between the liquid mixture and flour whenever you feel the added element is absorbed by the wheat. The flour will start to add up on top of the wheat creating small pearls. Keep going until you reach the desired size. Remember, it is a time-consuming process but, like everything that you put a lot of effort in, it is worth it. You can make them the night before and lay them covered with a plastic sheet overnight or make them in the morning and set them aside till it’s time to cook them. And this is how we eat it. For serving, add a large spoon of maftoul and top with stew and enjoy. This hearty meal is good on its own. Do not attempt to make any starters or salad. You’ll mess things up. Desserts are also not advisable, unless after a few hours, or maybe at night. Recently, Anthony from NoGarlicNoOnions discovered Moghrabieh as street food and in a sandwich in Tripoli (our Lebanese Tripoli that is) and now I’m curious to tasting it myself. This entry was posted in Lebanese, Lunch, Palestinian, Personal, Recipe and tagged Boil, Cooking, Couscous, cuisine, discovery, east, family, Flour, food, gathering, Lamb and mutton, lebanon, mediterranean, middle, middle eastern, Morocco, Olive oil, palestine, palestinian, Sunday, Wheat. Bookmark the permalink. Hehe. Hope the post did it just. Thank you. My mother recently passed to heaven and we girls too modern to learn this labor of love. It is much work. Now she is gone and we could not find how to spell it or the recipe. Thank you for the detail you provided. I hope to learn to do this with practice then teach my daughters. You’re welcome. I’m sorry about your mother. I hope she rests in peace. Where are you originally from and how did you come to know moghrabieh? Please let me know of the results if you attempt to make this recipe. It is time consuming and takes a lot of practice. I tried helping mom at the time I documented the recipe but ended up with messy lumps compared to mom’s perfect maftoul. I’ll have to try it myself until it’s perfect. It’s a treasure to preserve. Ah, mother made this every Christmas and sometimes Easter. As she aged she purchased the maftoul and froze it. We do not want to purchase this but have our daughters make it by hand.